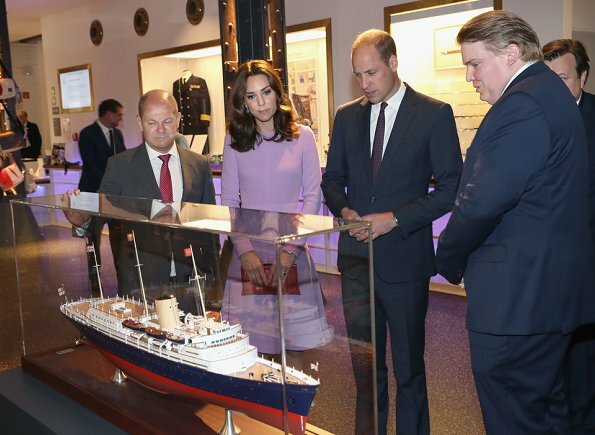 On the last day of their Germany visit, Prince William, Duke of Cambridge and Catherine, Duchess of Cambridge visited the Maritime Museum in Hamburg, Germany on July 21, 2017. 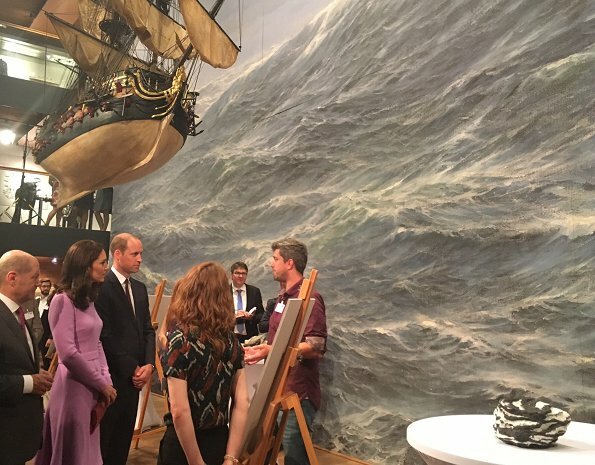 The Duke and Duchess of Cambridge will celebrate the joint UK-German year of science which for 2017 is focused on oceans. The Duchess wore a lavender bespoke dress by Emilia Wickstead on the 3rd day of the visit. 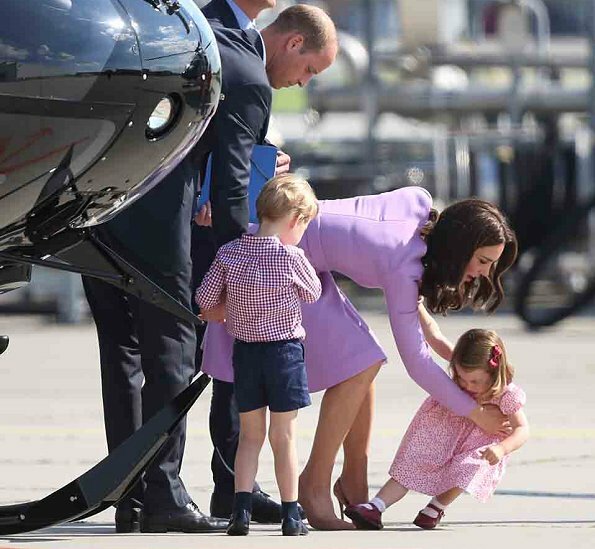 Prince William, Catherine, Duchess of Cambridge, Prince George and Princess Charlotte visited Airbus before departing from Hamburg airport on the last day of their official visit to Germany in Hamburg. I like very much this oufit except for the color of the clutch, I would have preferred, it has the same colour but in a much stronger tone. Wow she looks so wonderful! But I agree as for the colour of the clutch! My thoughts exactly. Down to the belt, kate's just more flared a line type. 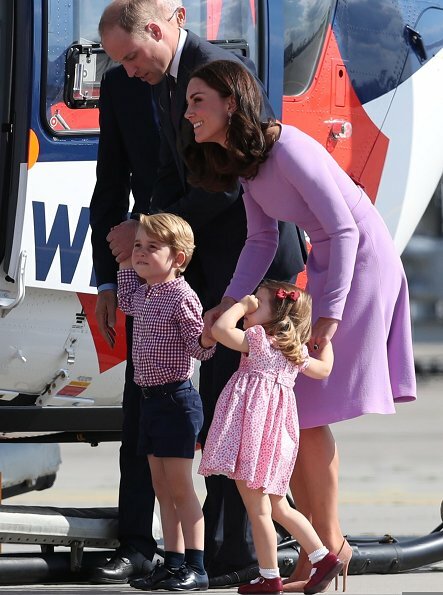 I LOVE that lavender dress!! Gorgeous!! This is a stunningly lovely dress with wonderful fit and tailoring, and perfect color. It suits her so well that ornamentation would be superfluous. She was wise to choose a slight flare in the skirt instead of the straight skirt shown on the model. I wonder what the fabric is. A dress like this shape would make a good 'uniform' like the dresses that Queen Mathilde chooses. She could wear it comfortably and know she looks really good. I agree about the flared skirt being much nicer than the straight one on the model. It is a lovely dress. Totally agree, this flared skirt is very flattering for her figure, plus easier to bend while tending to children. I am glad that she chose this color, it is beautiful. Normally I don't like matchy-matchy shoes and bag, and love some mixing, but this one doesn't make any sense. All in all, she looked great. She looks very lovely. Love the color. She looks very good, love the dress, shoes and earrings, bag not so much. She looks happy and relaxed, must have been nice days. Another winning look. Lavender color suits so well with her skin color. I like the colour of this dress very much and the clean, sharp tailoring. Personally, I prefer the version on the model but this way is more the Duchess's style. 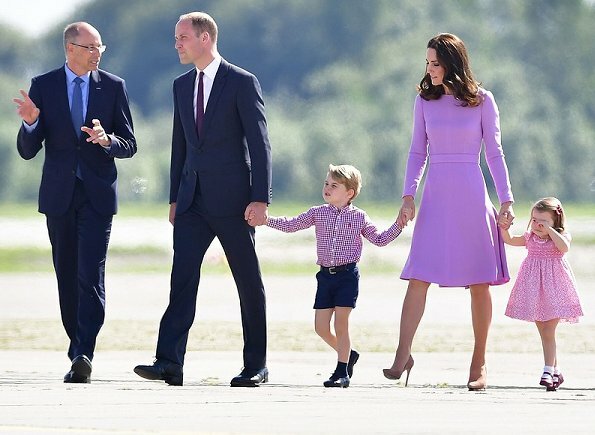 Agree about the colour of the clutch - maybe it would have been nicer to have shoes and clutch matching each other but in a deeper shade of lilac. Anyway, she looks lovely - she has worn some nice pieces this tour. Wonderful dress and colours. It is very smart and suitable, but colour dazzles. I love this earrings. This is my favorite dress of the tour! 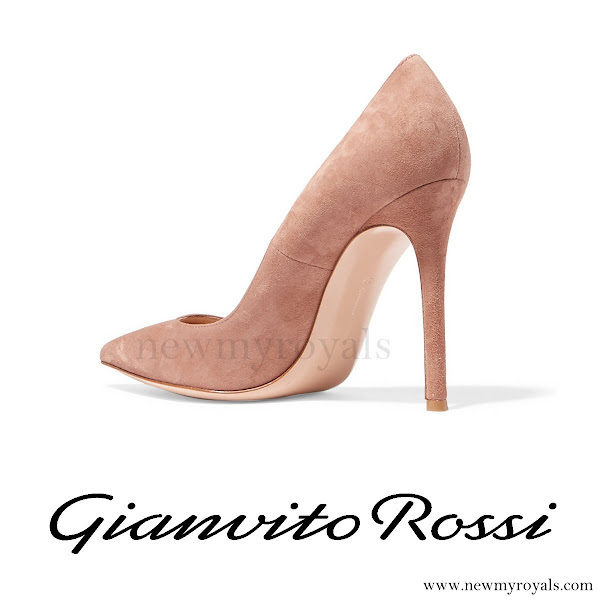 It has elegant ease. Perfect fit; gorgeous color; great length. 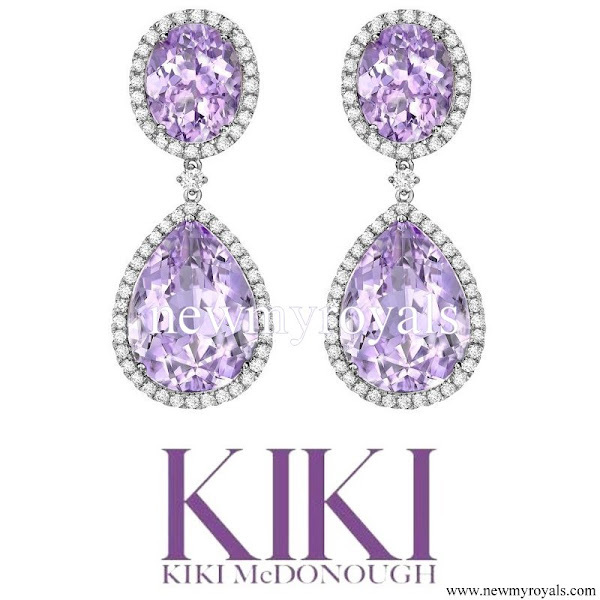 And I love the Kiki McDonough earrings because they are clean and unfussy and showcase the beautiful stones. Are you sure Kate and the model are wearing the same dress?? I was thinking the same. How can you give credit to a designer when almost every aspect of the design is altered? The only design feature that didn´t get changed are the sleeves, and the fabric itself obviously. When the altered design then even ends up looking better than the original, you have to wonder what you need designers for in the first place. The way it works is that she sees a dress in the designer's collection that she likes. The designer and Catherine get together and change the original design and that makes the dress a custom design just for Catherine. That is what is meant by a bespoke or a custom design. They take an original design, and change it for the person buying the dress. 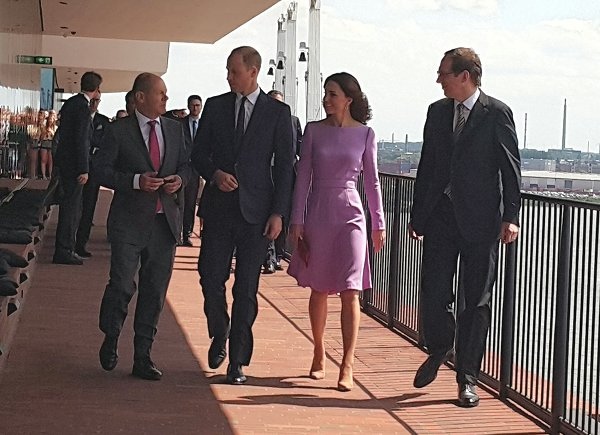 Catherine's dress is a bespoke version of the original design. She often has designer models altered to suit her. The designer still deserves credit for making the dress. Stunning, elegant and stylish dress. The Duchess looks gorgeous. Love the suite of the Duke and his tie match the colour of the Duchess dress. 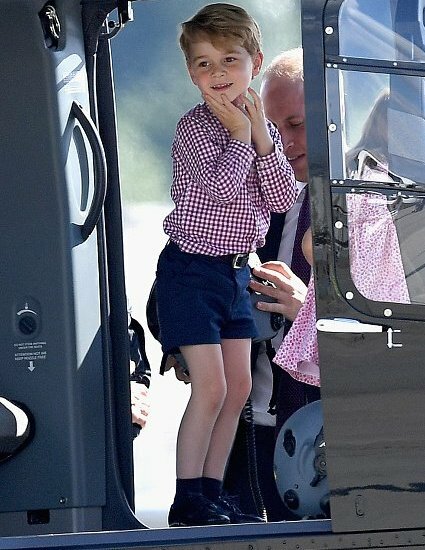 George enjoyed his visit to the helicopter. 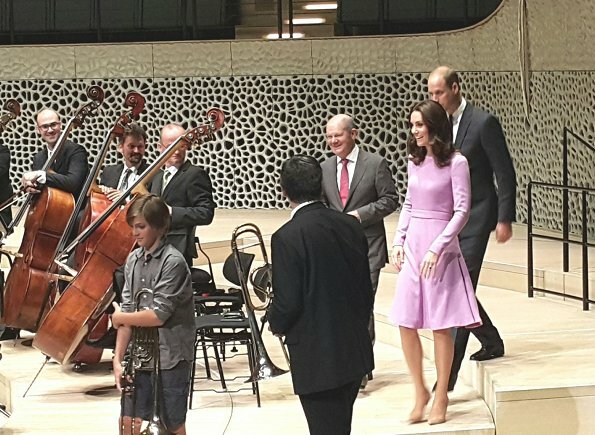 The Duchess conducting Beethoven's Fifth Symphony and she can also play the flute. Stunning, much in love happy all-round family!! stylish no!!! all her clothes look the same in diffetent colours!!! Das Kleid gefällt mir sehr gut. Aber Clutch, Schuhe und Kleid passen nicht zusammen - Clutch hat falsche Farbe. I love everything about this, including the clutch. It adds interest, rather than looking so "matchy matchy." I think her pumps could have even been a slightly darker shade than the clutch. 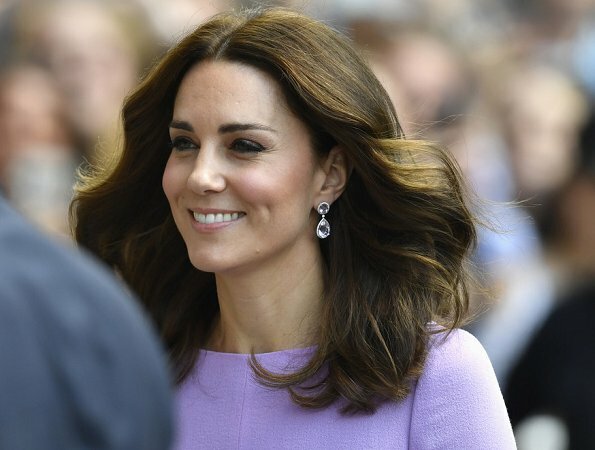 But again, I think this is Kate at her best--gorgeous, glamorous, yet entirely professional. Yes, it was quite a cute little tantrum really! Yes, it is very cute to see that children of two year are all the same and the normal behavior of that age!. Children and toddlers must misbehave!! That forms part of how to discipline them. Duke was guilty one he took her papers from her!!! very sweet. Lovely elegant dress. It suits her perfectly. I rather like the clutch as its a pop of colour. nothing beats a perfectly fitting dress. ils sont vraiment adorable tous les quatre. 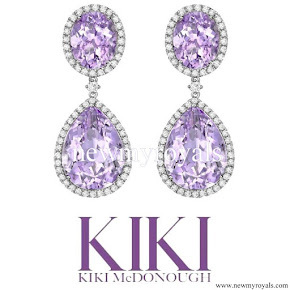 Magnificent earrings! Lovely elegant dress, the shoes look great too, however I think Kate would have looked nicer has she worn her hair up or taken back, I think this would have made Kate look a little less tired as well as highlighting her beautiful earrings. mooie jurk en prachtige kleur. Ze past Kate perfect, maar als je zo smal en mager bent pas alles je.